Al-Bahah (Arabic: ٱلْبَاحَة‎, Al-Bāḥah) is a city in the west of Saudi Arabia in the Hejaz area. It is the capital of Al Bahah Region, and is one of the Kingdom's prime tourist attractions. It enjoys a pleasant climate and is surrounded by more than forty forests, including Raghdan, al Zaraeb and Baidan. Al Baha is the headquarters of the Governor, local councils and branches of governmental departments. Receiving the state's special attention, the city of Al Baha abounds in educational, tourist and health institutions. It is considered the capital of the Ghamdi and Zahrani tribes in Saudi Arabia, and most of its inhabitants are from the native tribes. The name "Pearl of Resorts" is the name given to Al-Baha by those acquainted with the city. The name "Garden of the Hejaz" (Arabic: حَدِيْقَة ٱلْحِجَاز‎, translit. Ḥadīqaṫ al-Ḥijāz) was the name given to it by the Sharif of Mecca. Al-Baha City (BC) lies in the west of the kingdom of Saudi Arabia in the Hejaz region, between Mecca, which borders it from the north, west, and south west, and Aseer which borders it from the south east. It is the smallest of the kingdom's provinces (11,000 square kilometres (1,100,000 ha)). It is surrounded by a number of cities, including Taif on the north, Beesha on the east, and the Red Sea coast city of Al Qunfuda on the west. This tourist city is situated in an area characterized by natural tree cover and agricultural plateaus. It consists of six towns, the most important of which are Beljarshy, Almandaq, and Almekhwah, in addition to the Baha city in the center of the province. The province comprises 31 administrative centers and has a population of 533,001. Al-Baha is the homeland of the Ghamid and Zahran tribes and is divided geographically into three distinct parts: Sarah, which contains the high Hejaz mountains characterized by temperate weather and rich plant cover due to relatively high annual rainfall, Tihama which is the lowland coastal area to the west of the Hejaz characterized by very hot and humid weather and very little rainfall average, and the eastern hills characterized by an altitude of 1,550 to 1,900 metres (5,090 to 6,230 feet) above sea level with cool winters, hot summers and sparse plant cover. The largest city in the province, both in population and area, is Baljurashi, the second one is Al-Mandaq. In Tehama, there are two major cities: Qilwah and Al-Mikhwah. The number of tribes are 18, branching from the main ones, Ghamid and Zahran. The province has 13 settled tribes (working in trades and agriculture) and 5 nomadic tribes. Al Bahah has a hot desert climate (Köppen climate classification BWh). The climate is greatly affected by its varying geographic features. Generally speaking, the climate in Al-Baha is mild with temperatures ranging between 12 to 23 °C (53.6 to 73.4 °F). Due to its location at 2,500 metres (8,200 ft) above sea level, Al Baha's climate is moderate in summer and cold in winter. The area attracts visitors looking for a moderate climate and pristine, scenic views. In the Tehama area of the province, which is down on the coast, the climate is hot in the summer and warm in the winter. Humidity ranges from 52%–67%. While in the mountainous region, which is known as As-Sarah, the weather is cooler in summer and winter. Rainfall in the mountainous region lies in the range of 229 to 581 millimetres (9 to 23 in). The average throughout the whole region is 100 to 250 millimetres (3.9 to 9.8 in) annually. Post-World War 1, the village of El-Zafir (Arabic: قَـرْيَـه الـظَّـفِـيـر‎, translit. Qaryaṫ aẓ-Ẓafîr) had been the administrative centre of what was known then as Belad Ghamid, but with the establishment of Saudi Arabian government Ghamid and Zahran was administered as a unit in 1925, and the seat of local government transferred to Baljurashí (Arabic: بَـلْـجُـرَشِي‎), a town situated fifteen miles south of El-Zafir. The tribes of Al Baha, that is Ghamid and Zahran are the indigenous people of Al Baha. Tribes in the region trace their origin to the ancient Arabian Mamlakaṫ Saba’ (Arabic: مَـمْـلَـكَـة سَـبَـأ‎, possibly the Kingdom of Sheba), whose rule extended to areas presently known as Syria and Lebanon. Historians also report that they established the famous state of Axum, in Abyssinia. Prince Husam bin Saud is the governor of the province since April 21, 2017. Al Baha is also known for their traditional towers, each of which is called a qaṣbah (Arabic: قَـصْـبَـة‎). It was said "Apparently unique to Albaha architecture are the qasaba towers. Controversy surrounds their function—some argue that they were built as lookouts, and others that they were keeps, or even granaries. Perhaps it is a combination, although the right position of a watchtower, on a hill top, is the wrong place for a keep or granary." Dhee Ayn Village (Arabic: قَـرْيَـة ذِي عَـيْـن‎, translit. Qaryaṫ Dhí ‘Ayn) is situated at about 24 km (15 mi) southwest of al-Baha, across 'Aqabat al-Baha, also known as Aqbat King Fahad. This famous village sometimes known as "marble village" as it is built on a small marble mountain. The grove of palm trees is lush due to a small stream nearby. The villagers say that the marble village glows at sunset. It also has a steep escarpment road, running into and out of tunnels on the way up and down. Dhi 'Ain was famous for its fruits and banana plantations which still grow there. The village dates back about 400 years, and it witnessed the battles between the Ottoman Turks and its inhabitants. The village was named after an ‘Ayn (Arabic: عَـيْـن‎, water spring) continuously flowing from the nearby mountains to several reservoirs and each particular pond has its own name. There is a local legend that talks about a man lost his cane in one of the valleys, and to retrieve it he tracked it until he reached the village, he gathered its inhabitants and retrieved his cane after digging the spring: "Even the road that leads to the (Dhee Ayn) village is impressive, and several historical stone and slate towers dot the way. Al-Bahah Region is known as the region of 1001 towers, once built to protect villages, roads and plantations from rivalling tribes. Today, these towers are abandoned, and many of them are partially or completely in ruins." Al-Baha Domestic Airport is located 45 km (28 mi) to the east of Al Baha City Center and was founded in the Year 1982. "Al-Baha National Airport receives flights from all cities of the Kingdom and is located in Aqiq Province 45 km from Al-Baha city itself." King Fahd Hospital (Arabic: مُـسْـتَـشْـفَى الْـمَـلِـك فَـهْـد‎, translit. Musṫashfā al-Malik Fahd): "Initially, the hospital has been operated by one of the International specialist companies in directing and operating hospitals, but since 1421 it was self operated under the supervision of MOH." The city is known for its healthy and nutritious traditional meals brought by local farming such as Dagabees (Arabic: دغابيس), Aseeda (Arabic : عصيده). The region is known for its ancient mining sites. Major gold mining areas were those of Khayāl al-Maṣna‘ (Arabic: خَـيَـال الْـمَـصْـنَـع‎) and Al-‘Aqīq (Arabic: الْـعَـقِـيِْـق‎). The village of Kuna has over one hundred building structures which date back to South Arabian Civilization. Visitors from inside the kingdom and nearby countries are particularly attracted to the area by its more than 53 forests, which include the Raghdan forest, which covers an area of 600,000 square metres (60 ha) just 5 kilometres (3.1 miles) from the city. Iit has been provided with children's playgrounds and other amenities. The Amdan forest is 55 km (34 mi) to the north of Al Baha. It abounds in olive trees, Ara'r shrubs and other natural vegetation. The Wadi Feig forest is 8 km (5.0 mi) from Al Baha. It is encircled by a green valley littered with apricot, pomegranate and grape orchards. The forest of Wadi Al Ageeg is 40 km (25 mi) from Al Baha and abounds in various fruit trees and tall lotus trees. Al Baha airport is in Ageeg city. Al Kharrara waterfall is 30 kilometers to the south of Al Baha. Its scenic view attracts a large numbers of visitors. Shada Mountain (Arabic: جَـبَـل شَـدَا‎, translit. Jabal Shadā) is the highest summit in Makhwah. It features rare rocky formations that attract amateur climbers of various levels. The Arabian leopard is known to exist in the Asir mountains between Al-Bahah and Abha. It is also present in the Hijaz mountains to the north. St John Philby (also known as Sheikh Abdullah by King Abdulaziz) documented his journey crossing from Riyadh to Jeddah by the "backdoor" route, writing on the Al Baha district of Arabia in his famous book The Arabian Highlands . Later he was awarded the Royal Geographical Society Founders Gold Medal for his written desert journey. ^ "Climate Data for Saudi Arabia". Jeddah Regional Climate Center. Archived from the original on 2012-05-12. Retrieved January 26, 2016. ^ "Saba / Sa'abia / Sheba". The History Files (http://www.historyfiles.co.uk). Retrieved 2008-06-27. 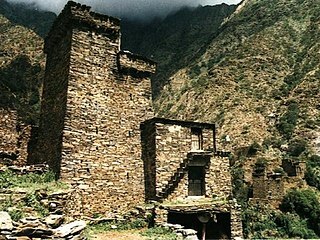 The kingdom of Saba is known to have existed in the region of Yemen. By 1000 BC caravan trains of camels journeyed from Oman in south-east Arabia to the Mediterranean. As the camel drivers passed through the deserts of Yemen, experts believe that many of them would have called in at Ma'rib. Dating from at least 1050 BC, and now barren and dry, Ma'rib was then a lush oasis teeming with palm trees and exotic plants. Ideally placed, it was situated on the trade routes and with a unique dam of vast proportions. It was also one of only two main sources of frankincense (the other being East Africa), so Saba had a virtual monopoly. Ma'rib's wealth accumulated to such an extent that the city became a byword for riches beyond belief throughout the Arab world. Its people, the Sabeans - a group whose name bears the same etymological root as Saba - lived in South Arabia between the tenth and sixth centuries BC. Their main temple - Mahram Bilqis, or temple of the moon god (situated about three miles (5 km) from the capital city of Ma'rib) - was so famous that it remained sacred even after the collapse of the Sabean civilisation in the sixth century BC - caused by the rerouting of the spice trail. By that point the dam, now in a poor state of repair, was finally breached. The irrigation system was lost, the people abandoned the site within a year or so, and the temple fell into disrepair and was eventually covered by sand. Saba was known by the Hebrews as Sheba [Note that the collapse of the dam was actually in 575 CE, as shown in the timeline in the same article in the History Files, and attested by MacCulloch (2009)]. ^ Robert D. Burrowes (2010). Historical Dictionary of Yemen. Rowman & Littlefield. pp. 234–319. ISBN 0810855283. ^ Mostyn, Trevor. 1983. Saudi Arabia- A MEED Practical Guide. London: Middle East Economic Digest. 2nd edition. Page 320. ^ "Al-Baha, Saudi Arabia". Albahakfhaa.org. Retrieved 2012-09-17. ^ "King Fahad Hospital, Al-Baha, KSA". Albahakfhaa.org. Retrieved 2012-09-17. ^ "KFH, Al-Baha Residency Training Programs". Albahakfhaa.org. Retrieved 2012-09-17. ^ "KFH, Al-Baha Medical library". Albahakfhaa.org. Retrieved 2012-09-17. ^ a b c "Al-Baha City Profile". The Saudi Network. Retrieved 2012-10-02. ^ Judas, J.; Paillat, P.; Khoja, A.; Boug, A. (2006). "Status of the Arabian leopard in Saudi Arabia" (PDF). Cat News. Special Issue 1: 11–19. ^ Spalton, J. A. & Al-Hikmani, H. M. (2006). "The Leopard in the Arabian Peninsula – Distribution and Subspecies Status" (PDF). Cat News (Special Issue 1): 4–8.